Can Nazem Kadri Take the Next Step? Many wouldn’t consider a 50-point season as a year that needs improving on. But for a former seventh overall pick and a player that expects more from himself, Nazem Kadri’s 20 goals and 30 assists in 2013-14 is nothing more than a statistical line worth improving on this season. But it’s not just his offensive output that he knows needs work. The Leafs’ centre went from a plus-15 in 2012-13 to a minus-11 the following year. The team’s defensive liability was a major problem last season and Kadri knows that he’ll have to play a different role in the Leafs end of the rink to better his all-around game. “Obviously production is huge, you know, I’m an offensive player. But I just want to become the whole package,” said the 24-year-old Kadri. And as the Leafs’ second-line centre, more is expected from the native of London, Ontario – from both his teammates and his coaching staff. While he’s shown the ability to be a presence in the lineup, the team and its fans want to see the forward play with more consistency. The Leafs know that Kadri can be a special player – otherwise he wouldn’t have been drafted so high and the Leafs would’ve likely looked to move him already. Instead, he’s established himself as a role player on the team – putting up offensive numbers and agitating his opponents. “It’s something I always did, something my father taught me, he’d say establish yourself with a big hit, a verbal encounter, and it gets you into the game,” said Kadri in an interview with Toronto Star reporter Mark Zwolinski. Kunitz on Kadri being an agitator: "I wouldn’t even call him one of those types of players. He’s a skilled player, goes out & plays hard." And it’s that kind of play that Kadri needs to maintain over a full season. His ability to get under the skin of the top players on opposing teams translates into scoring when it comes to Kadri. The goal for the young player is to do it with some consistency – which has always been a criticism when it comes to his game. Head coach, Randy Carlyle, has been quite vocal during his time at the helm regarding Kadri’s play. But there is no arguing the flashes of brilliance that Kadri’s shown over his short career and Carlyle along with other Leaf players don’t shy away from praising his impressive play when he has the puck. Having had a chance to play alongside Kadri early in the preseason, newcomer David Booth is the first person to admit that the talented forward makes the game easier. The two seemed to click rather well prior to Booth’s injury late in training camp. But it’s clear by his admiration of Kadri’s game that Booth would love to play alongside the former London Knight. And Kadri’s play does open a lot of ice for his linemates. His ability to weave in and out of opposing players allows other Leafs to find the open holes – before Kadri threads the needle with his passing skills. While he does get himself in trouble sometimes, trying to do too much, he’s become stronger on the puck and along the boards giving him more confidence when the puck is on his stick. 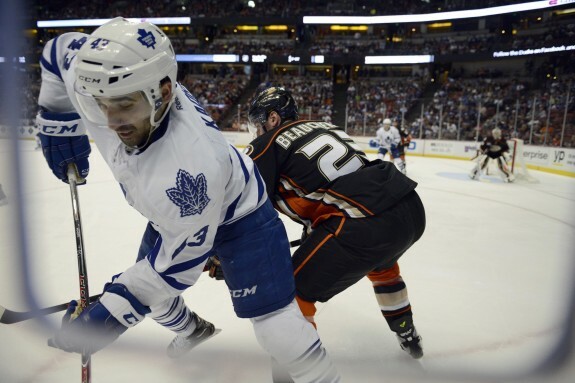 As an organization, the Leafs know they have a valuable tool in Nazem Kadri. What Carlyle and the rest of the organization’s front office hope for is that he’s able to take the next step during the 2014-15 campaign. “They’re going to play better lineups night in and night out and he’s going to have to continue to grow,” said Carlyle. Thus far, in 2014-15, Kadri’s been a factor for a Leafs team that has struggled with consistency early on. In four games, he’s recorded two goals on 11 shots. He’s still a minus-1, but continues to open up the game for the players on the ice with him. His ability to draw penalties is uncanny and his agitation of the opponents seems to be up to par to this point. He may not be the star – or the franchise player – when it comes to the Toronto Maple Leafs, but Nazem Kadri is most certainly an asset on a team that needs to develop the players they draft. At 24, he has a lot of hockey left to play and can become the whole package for a Toronto team looking for their young forward to take the next step.